Since, this is spring in this part of the world, I have a lot of my flowers plants blooming, including my Roses, Marigolds, and Ghazanias, and a lot other plants, in line to bloom, including my two Arabian Jasmine plants, a host of rose plants, which I recently added to my collection, some marigold plants, the Crepe Jasmine, the Rangoon Creeper (Quisqualis Indica), the Hibiscus (red) and my grape vine too (that I added last monsoon). 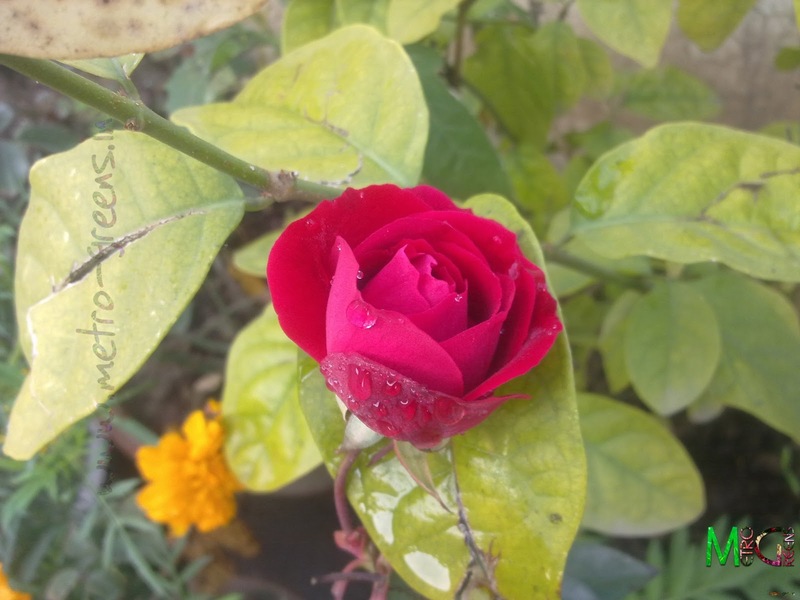 The flowers blooming during spring are one of the prettiest blooms, and here's one, one of my red roses. One of my red Rose. The stem of the flower as so thin, that I had to borrow support from one Arabian Jasmine stem. 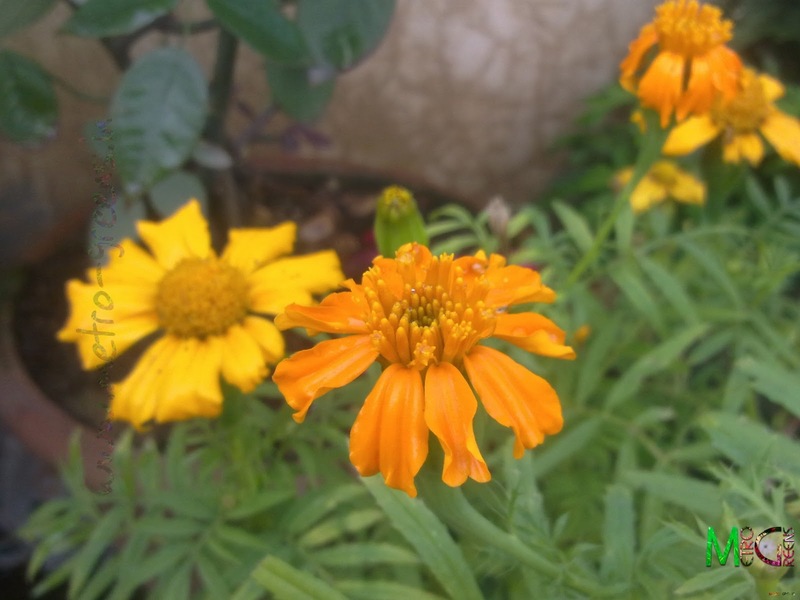 Since my marigold plants too, are blooming, I can have a feast for my eyes by watching the marigold plants with flower colours ranging from lime yellow to orange, and dark green foliage underneath. One of the many cultivars of the marigolds, I have. 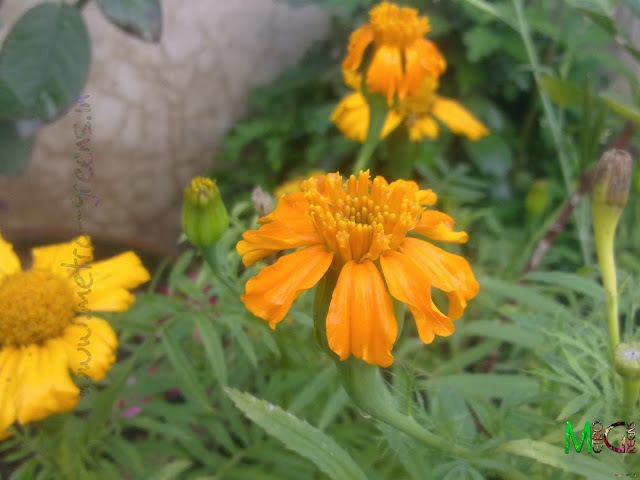 Marigolds are good flowers in their look and feel. Calendulas are too good bloomers, but, only during winters. Since these are annuals, they live for just the winters here, and die out before the spring, making way for a splash of colours for spring and summers. Both my Calendula plants have died, but, I have collected the seeds, hopeful that both will again bloom next season. 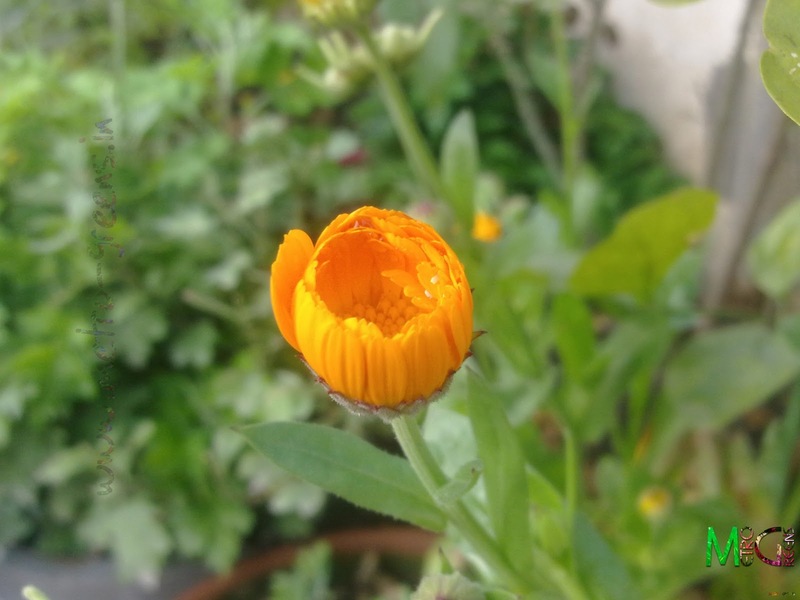 A ready to bloom bud of my orange Calendula plant. Watching water drops on leaves of plants, is always a feast, and make for a good subject for photography. It's always a feast to watch those small droplets of rain water in one of your plants leaves. This is from my red Rose plant. 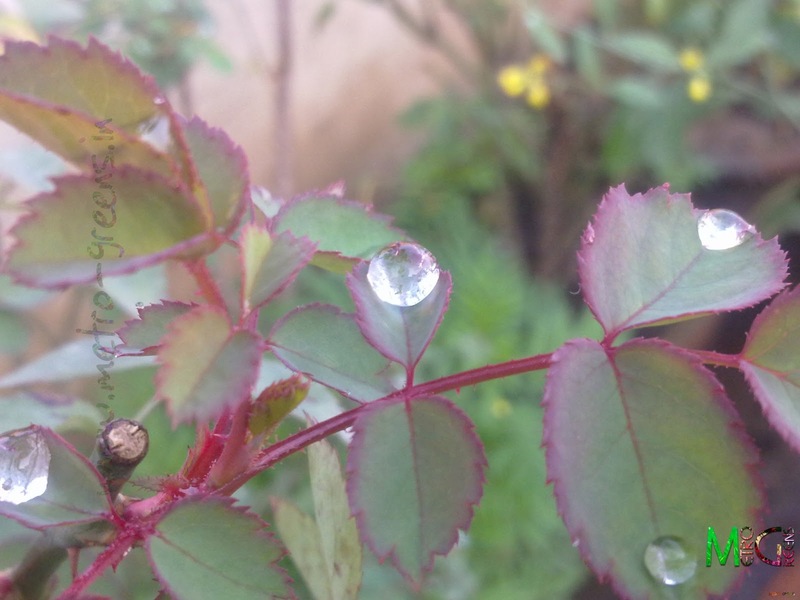 All these photographs were taken on a single day, and since it rained the last night, all the plants are either wet or have water drops on them. Thanks Sri. Comments like yours encourage me to blog more. We have to wait until summer to enjoy such blooms - such vibrant colours! loving your blog ! How cold do your winters get ? Here in the uk we are currently experiencing one of the coldest Marches we can remember with deep snow in some parts of the country. It is a good reminder of Spring, looking at your photos - hope ours will arrive soon ! Hello Jane. Thanks for visiting my blog. About the winters, here in this part of India (Delhi), we don't experience winters as cold as yours, though, the last winters, here were chilling, with the minimum temperatures dropping well below 2 degree celsius, but, we never experience snowfall, except some occasional hail stones about once a year or so. I wish that your spring comes soon, and we have some more flowers to watch.